This post explains how to design typical relationaships database for socialmedia web application. Today I'm presenting my labs.9lessons application database relations design and SQL with diagrams. I hope you like this post. Here you can see the five tables between relation flow user, friends, updates, comments and vote. This following image generated by using Mysql Workbench tool. Here users table relation with three tables friends, updates and comments. Here updates table relation with three tables users, comments and vote. Continue....: Next part How to join these tables. Really useful article, i cant wait for the next. Can i know what tool are you using for mysql for generating such diagrams.. Thank you. waiting for next lesson :) thanks! When the next part will come?! Yes .. It's good stuff! Very well explained.. thanks for your hard work. Wonderfull piece of information.Keep it up Sir! How do I create a script when the input to a table of friends it will be friends_one, friends_two, role? very good ....help for database design..
i m not getting the use of friend_two? pertanyaan saya adalah bagaimana cara menampilkan user yang bukan teman, dengan menggunakan mysql? Hi..some one,, can u help me?? how to display SUGGEST FRIENDS with php and MYsql statement?? for the FRIENDS TABLE , you can see above..
Great stuff, I love how neat and tidy this article is, very well organised and loving the pictures. In friends table you have Friend_two. What is Friend_two and why you should use it? without using it you can return user1 friends or user2 without seeing each others friends. Hello, this is very nice article. But I have one question. 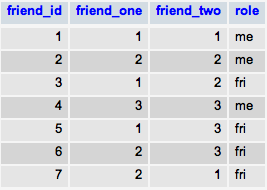 What is the user of column "friend_two" in "friends" table and from you are inserting data in that column.